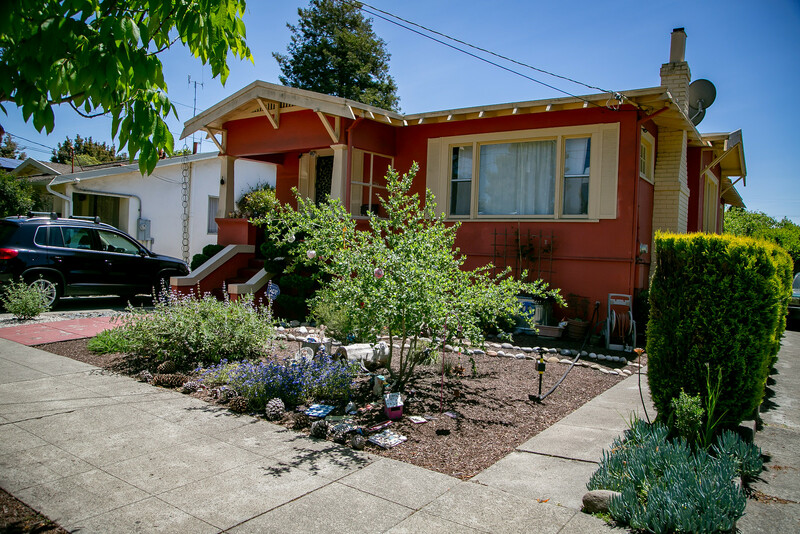 I walked the 1400 block of Parker Street in February, 2013. 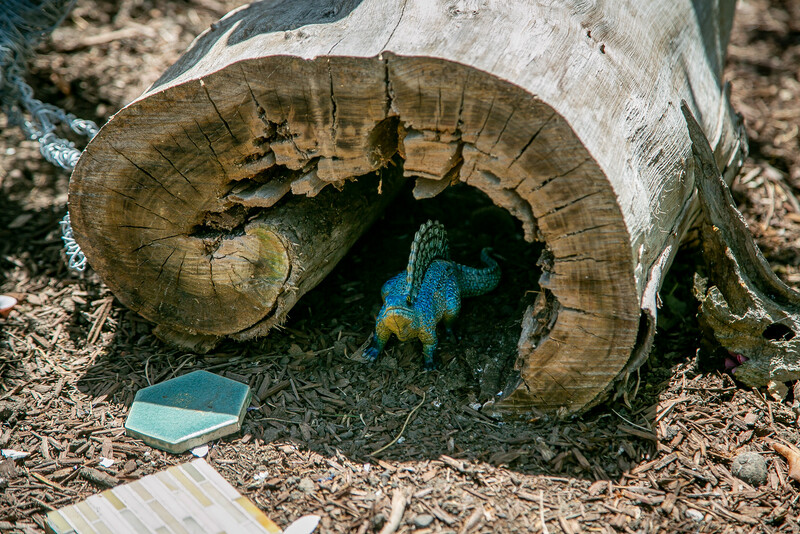 There was no small world, no nothing in front of 1426 Parker as there is now. Claire Ittner came across 1426 Parker for her Material Culture class with Margaretta Lovell. She told me about it – lucky for me! 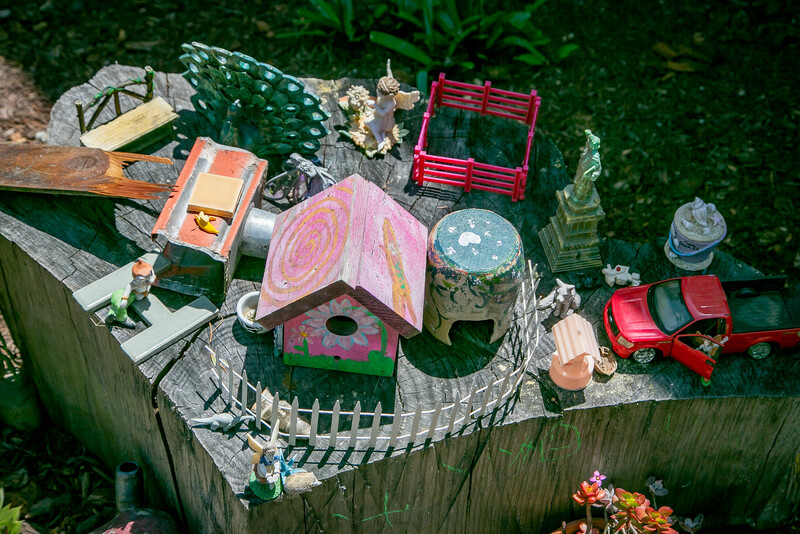 Liz Schultz began making this assemblage, this diorama of the yard, this small world, two years ago when her daughter was five. 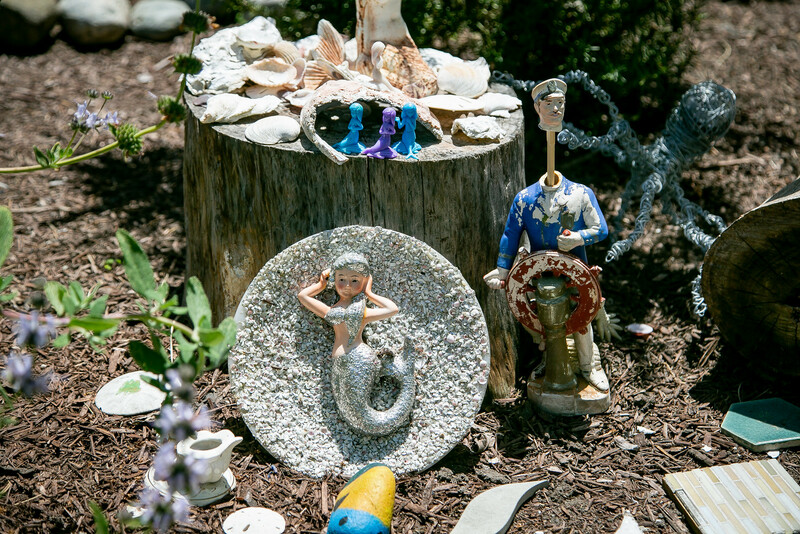 She calls it a fairy garden. The long shot doesn’t do the yard justice. The adorning extends to the curb strip, the front yard itself, and the front porch. 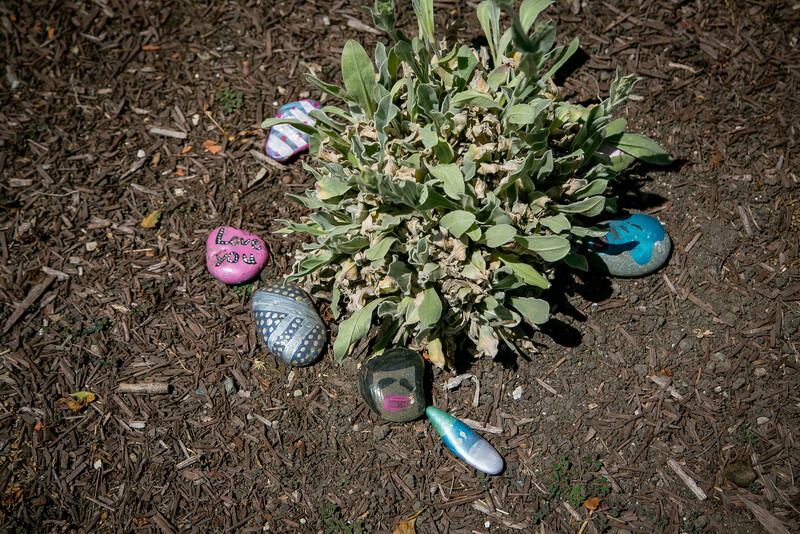 There are painted rocks in the curb strip. 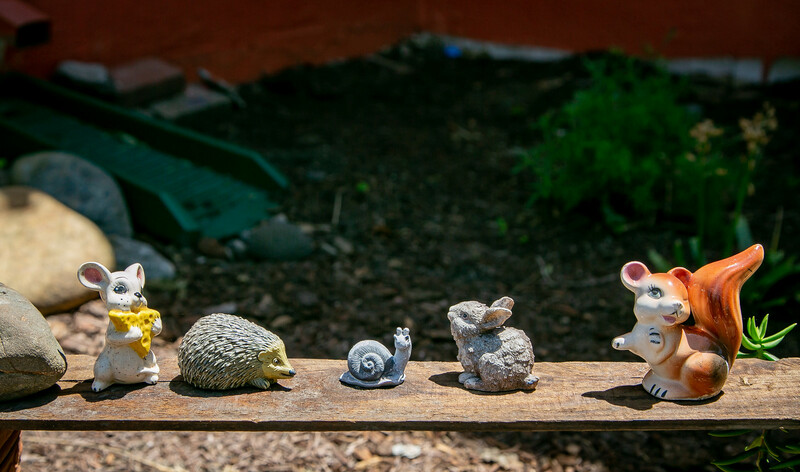 In the yard – gnomes and fairies, ceramic figures Schultz made, random toys donated by neighbors, a piece of bark form a hundred-year-old oak tree that was on Schultz’s great-grandparents’ property in New Jersey, and what Schultz calls “bits and bobs” from all over. 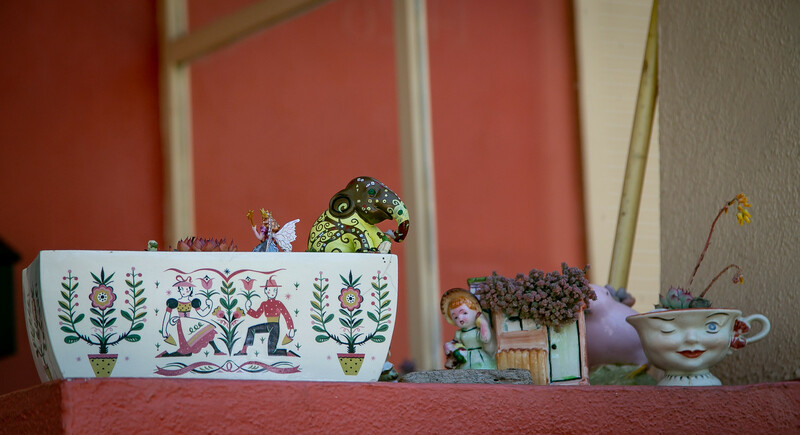 The pieces are reshuffled periodically to make room for new combinations and new stories – think of it as migration. 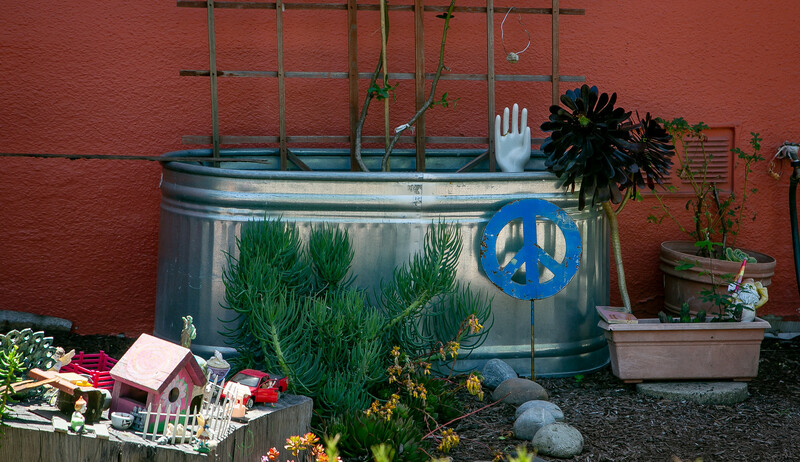 Against the house is a galvanized tub – with a hand and a peace sign. 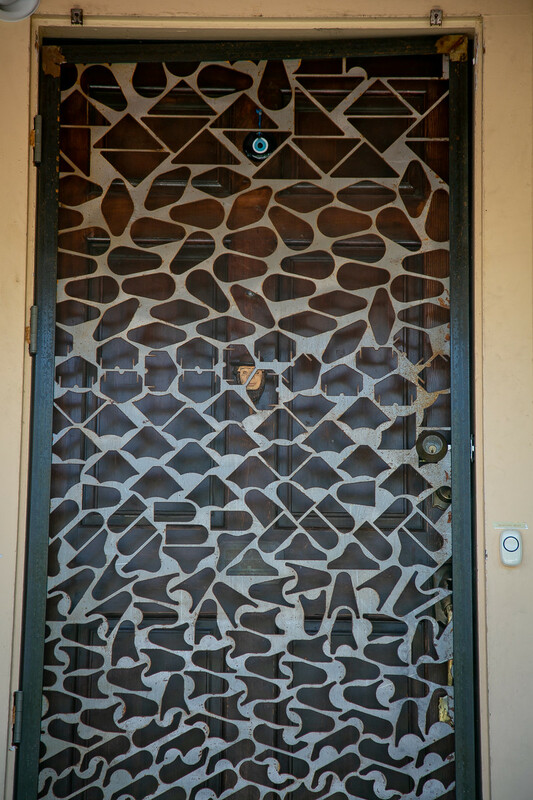 There is a significantly quirky front door on the porch. Good job mother and daughter! 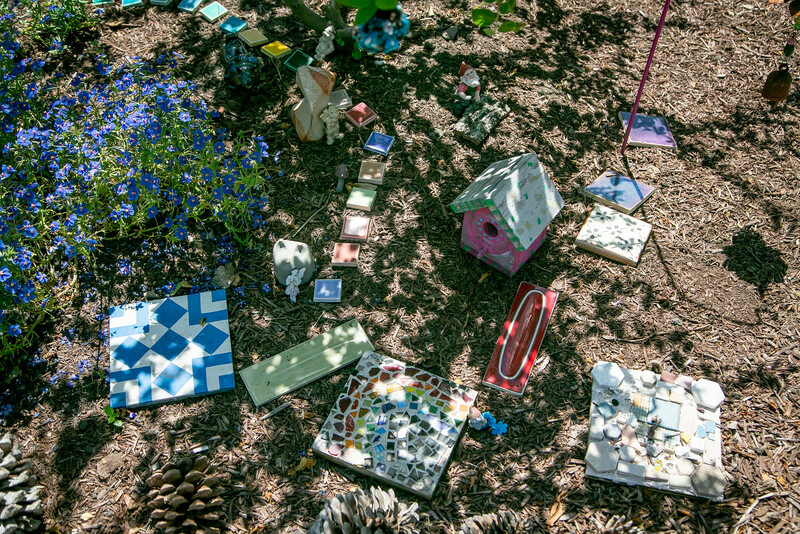 What is there to learn from this lovely Fairy Garden? 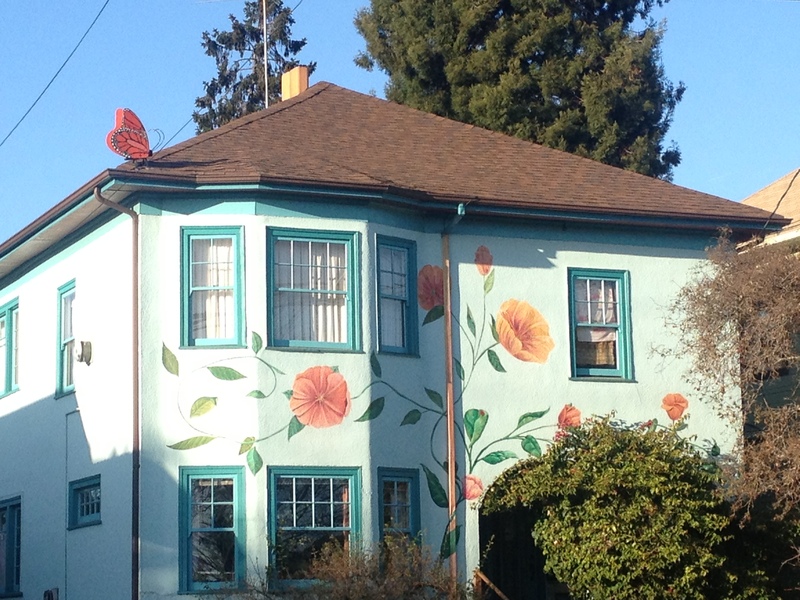 Berkeley is changing, yet here is proof positive that our dear old Berkeley is not dead. 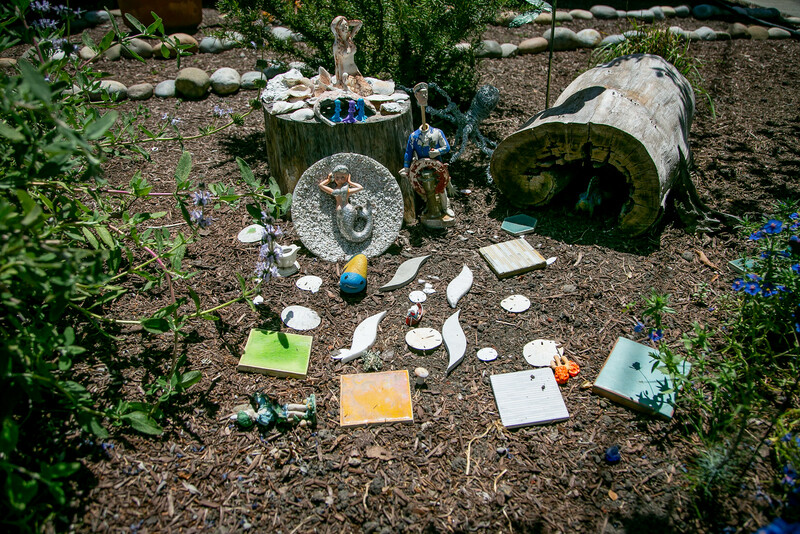 A woman and her young daughter have turned their front yard into a land of fairies and lizards of unknown origins and gnomes and mermaids. They invent stories about the creatures and shuffle them and people add pieces. And it is all a gift to the street. I know this stretch of Parker Street. Between the summer of 1978 and early 1981, the legal department of the United Farm Workers was gutted by Cesar’s purges. 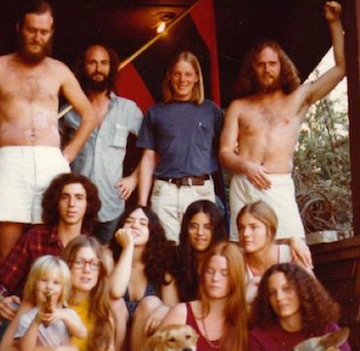 Sandy Nathan and Kirsten Zerger were two of the 18 really bright and hard-working and lawyers who were purged. 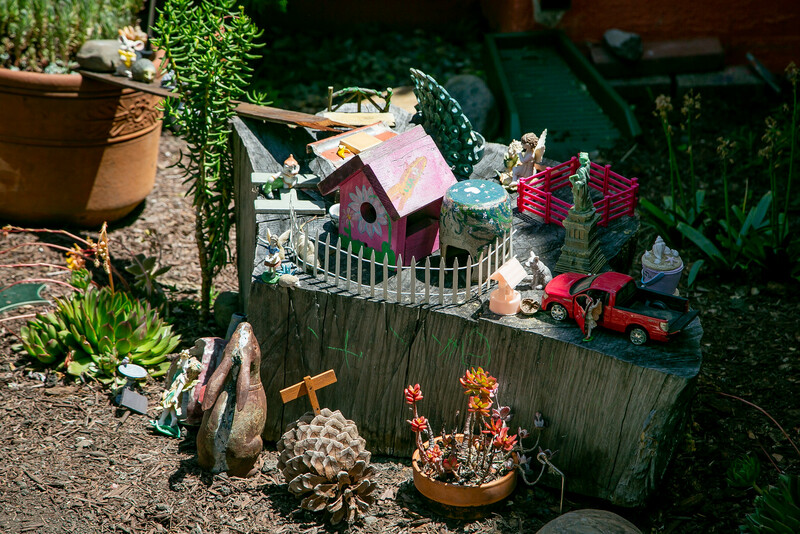 They found labor law jobs in the Bay Area and bought a house on Parker two blocks west of the Fairy Garden shown here. 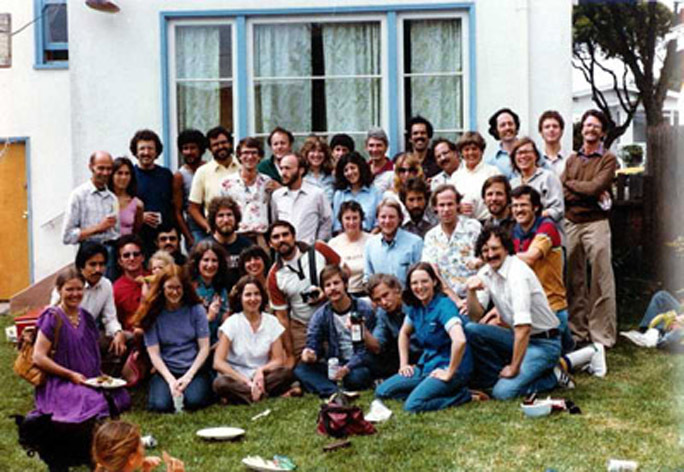 In 1980, we had a reunion of the legal department in their back yard. Kirsten is in the front with blue shirt and blue jeans. Sandy is just right of her, white shirt, black hair, mustache. She is Mennonite. He is Jewish. I am in the Hawaiian shirt towards the right of the second row. Just left of me is Bill Monning, a member of the California State Senate who serves the 17th Senate District on the Central Coast. Just right of me is John Rice Trujillo. He disappeared swimming in Hawaii in late 1982. I surely miss him even now all these years later. Kirsten and Sandy moved to McPherson, Kansas a few years later – a good place to raise their three boys. Well, yes, that’s a factor. 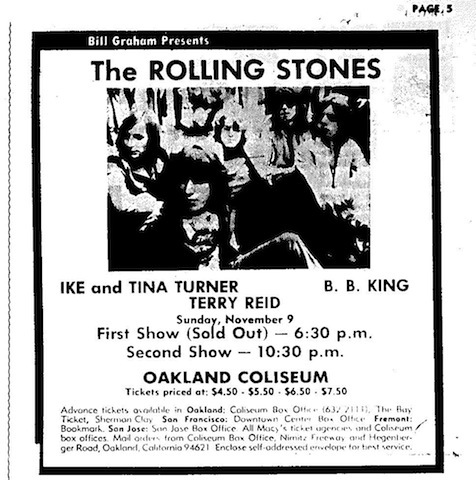 But beyond that, I have watched Parker Street evolve for almost 40 years. Something is lost and something is gained with the evolution. 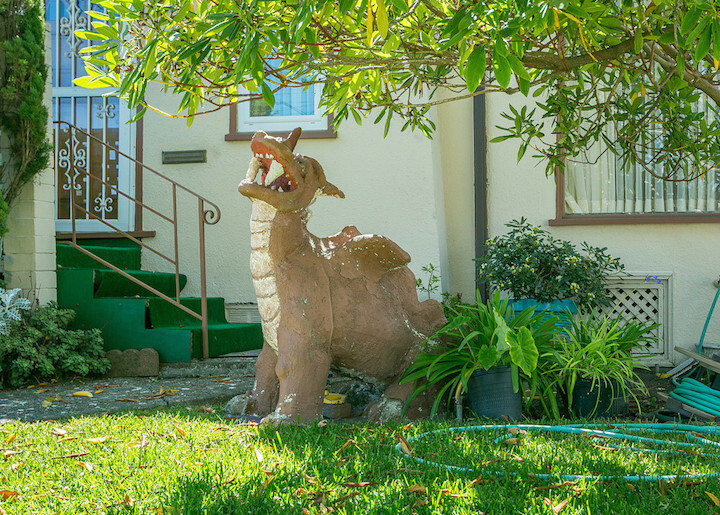 This dragon at 1240 Parker wouldn’t have been there 37 years ago. 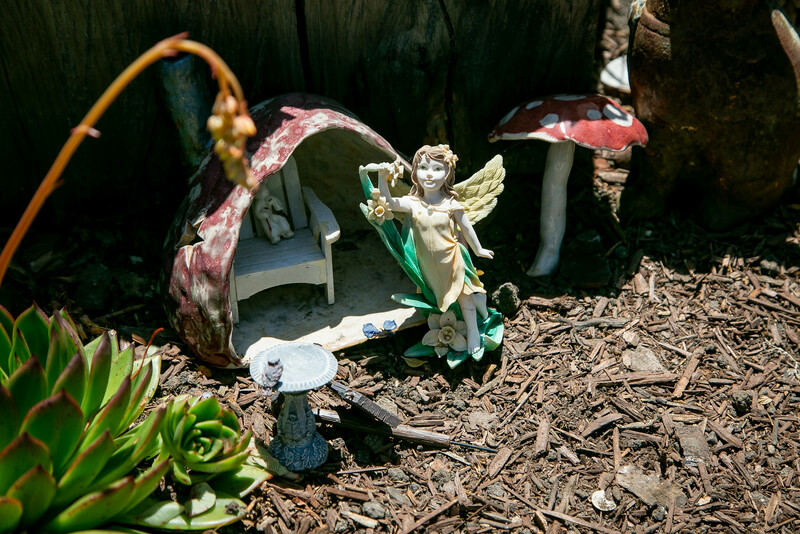 Ditto the Fairy Garden. Keep it Quirky Parker Street! On the cosmic scale, there is a big issue to overcome on Parker. 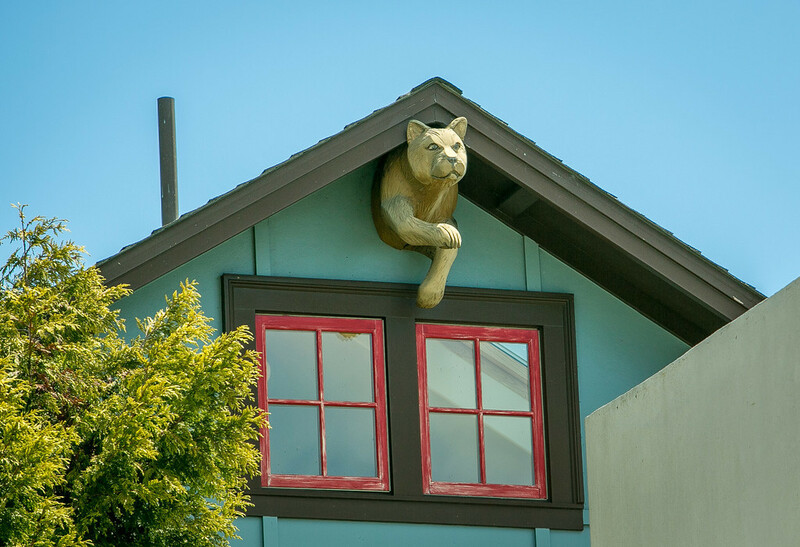 There is seriously bad mojo for Parker Street – the Parker Apartments at Parker and Shattuck. I read these words and wonder, truly wonder, what language they rejected if this is the best that they could come up with. What else can we conjure up to counter the apartments? 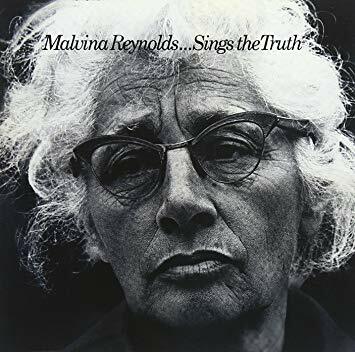 Malvina Reynolds lived at 2027 Parker Street – the Muse of Parker Street. BIG POINTS for that. 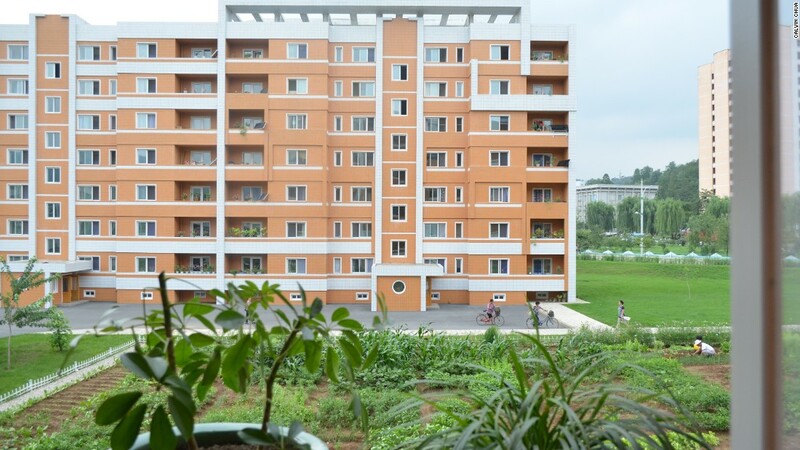 One can only imagine what the woman who wrote “Little Boxes” would have to say about the Parker Apartments where you can dare to discover your inspiration. Long ago the Red Sun Rising Collective was at 2239 Parker. 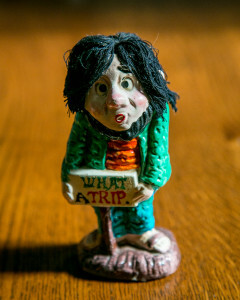 This is what they looked like in 1970-ish. Let’s not even think about Parker Apartments and Equinox and choosing our own adventure. 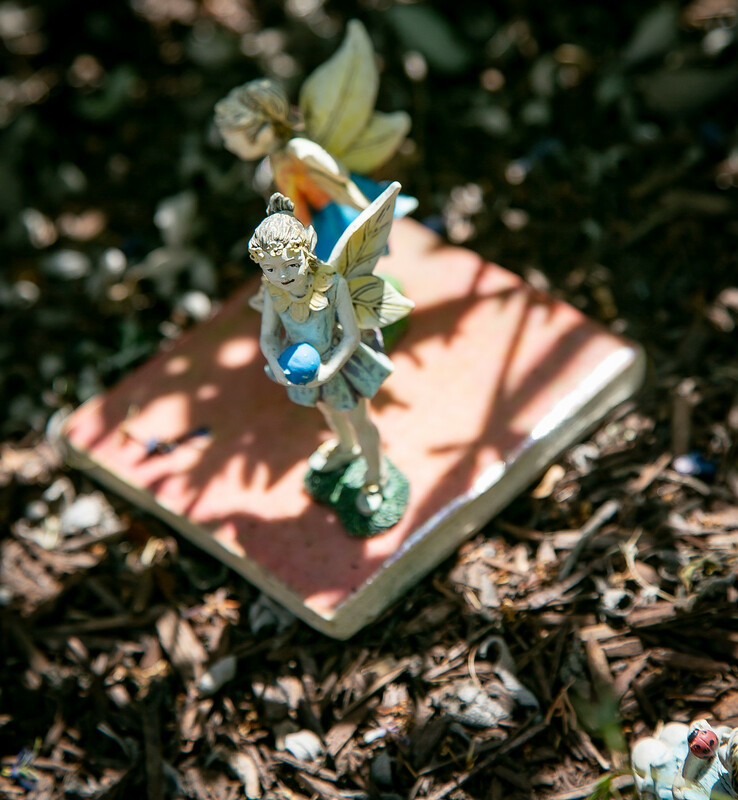 Let’s just celebrate the wonder of the Fairy Garden. OK – enough about Nestor Makhno. What about the post?